This blueprint shows the front and side profiles of the proposed jig back bucket for use in the tramway. Relevant measurements and dimensions are included as well as location placements for the track stand and traction rope. Corresponding note on accompanying photo description page: "Pictures taken July 5th, 1952. 7. Tentsite. Looking east." Photograph depicts man in distance on scaffolding. Corresponding note on accompanying photo description page: "Pictures taken July 5th, 1952. 11. Mill construction. Looking west." 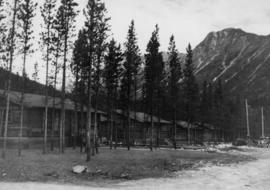 Photograph depicts buildings in plant site, mountains in background. Corresponding note on accompanying photo description page: "Pictures taken July 5th, 1952. 12. Mill, Power House & Water Tank." 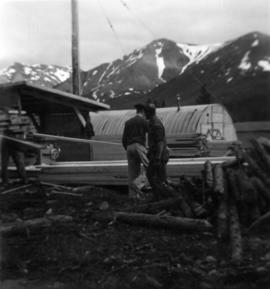 Photograph depicts men working on truck dump construction, mountains in background. Photograph depicts interior framework of building under construction, mountains in background. Photograph depicts men on mill scaffolding, mountains in background. Corresponding note on accompanying photo description page: "Pictures taken June 11th: (4) Mill construction. Looking north." Photograph depicts two men working on early stages of building believed to be mill. 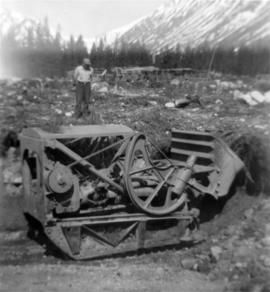 Photograph depicts track loader moving dirt in semi-cleared area, man and mountains in background. Corresponding note on accompanying photo description page: "3. Excavating for ore haul truck dump. Looking west". Photograph depicts four buildings in trees at end of dirt road, mountains in background. Corresponding note on accompanying photo description page: "7. Prefab buildings for staff families and guest lodge. These buildings nearly completed." Photograph depicts truck on right of large building in flat yard at Watson Lake. Corresponding note on accompanying photo description page: "8. 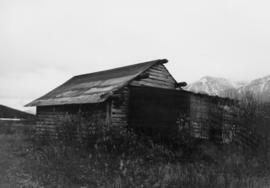 Warehouse at Watson Lake owned by Cassiar. Located near Jac & Macs." 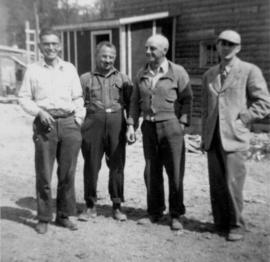 Photograph depicts 4 men working on early stages of mill construction, mountains in background. Corresponding note on accompanying photo description page: "9. Erecting wall posts on mill foundations. Looking west." Corresponding note on accompanying photo description page: "1. Four staff members. L to R - Paisaud, Farewell, Hood, Ward - Taken in front of the office." Photograph depicts power house construction, trees and mountains in background. Corresponding note on accompanying photo description page: "5. Diesel power house. Wall footings poured. Lumber piles in background." Photograph depicts two men standing on concrete foundation poured into wood frame in dirt area. Corresponding note on accompanying photo description page: "2. Crib and gravel foundations for oil tanks." Photograph depicts group of men digging trenches in snow, mountains in background. Corresponding note on accompanying photo description page: "9. Digging Mill foundations." Photograph depicts a long building speculated to be garage behind large snow pile. Truck semi-visible behind snow, another truck partially captured on right. Snowy road in foreground, mountain peaks in background. Handwritten annotation in blue ink on recto of photograph: "Portion of Garage interior". Photograph depicts two men standing in rear of garage interior. One car and Eimco loader can be seen in stalls. Photograph depicts construction worker walking up mountain slope, possibly using rope safety gear. Wood framework for Crusher building in foreground; mine road, plant site, and mountain range in background. View facing into mountainside and showing various levels of foundations. Men can be seen working on site. Unidentified machinery and pile of long metal rods in foreground. Handwritten caption beside this photo reads: "View of completed building." Large door on side of building, offering view of interior. Miscellaneous material in snowy foregrounded area: tractor equipment, steel drum, lumber etc.